On June 29, the Organization for the Prohibition of Chemical Weapons, OPCW, published its final report on events in the Syrian city of Khan Sheikhoun on April 4, 2017. As you’ll recall, President Donald Trump struck a Syrian air base a few days later in retaliation for what the United States and allied nations, as well as the Syrian opposition, say was an attack by President Bashar al-Assad’s air force. 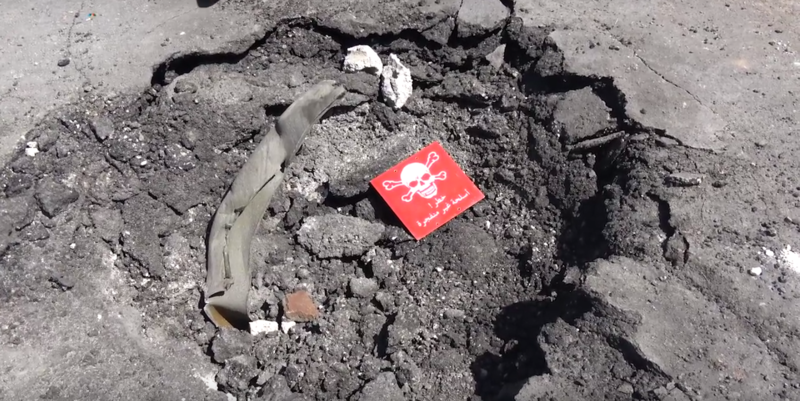 The Syrian government denies involvement and has variously said its jets accidentally bombed a rebel chemical storage or blamed a rebel false flag operation backed by Western intelligence services. Russian diplomats have backed up Damascus and lobbied hard to discredit the OPCW investigators in international fora and in the media. Western nations, too, have played some rough politics on this issue, and the whole debate has turned incredibly toxic and divisive—which is ironic, since all involved claim to want to uphold the international ban on chemical weapons. The OPCW Fact Finding Mission has confirmed the use of sarin, a banned nerve agent, in the Khan Sheikhoun incident, but it did not assign responsibility to either side. Why? Because that wasn’t its mission. Instead, another team of investigators known as the OPCW-UN Joint Investigative Mechanism, or JIM, are now taking over to try and name the perpetrator. It won’t be an easy job, at least not if they are to produce evidence that would hold up in court. It might also be a very dangerous mission, especially if they try to get to Khan Sheikhoun itself. The city is run by hardline jihadis and it is close to one of Syria’s most anarchic and violent frontlines—and for all the lingering question marks, we know one thing for sure: whoever was behind the April 4 killings has a very strong interest in preventing the investigators from getting safely in and out. In a new report for The Century Foundation, I try to walk readers through some of the obstacles, problems, and possible surprises that the JIM investigators face. They’ll be working under tight time constraints and are up against what could very well turn out to be impossible odds, but their work is of the greatest importance not just for Syria, but for the global ban on chemical weapons and for international law. An interim report may arrive in September or even as early as August, but the JIM’s final report, which may or may not name a perpetrator, is scheduled for release in October. That’s just weeks before the JIM mandate runs out. The investigation will be forced to swim the veto-infested waters of the the UN Security Council to win an extension in November. It is not a lot of time, and the JIM leaders are already complaining about obstructions and pressure, including foot-dragging by the Syrian government and constant interference from state actors telling them how to do their work. To be sure, the JIM has hired a highly competent bunch of experts and investigators, but in this environment and on that time frame, it’s anyone’s guess if they’ll be able to put all pieces of the puzzle together before the clock runs out. Read the report here. Much more will certainly be written in the coming months. Topography of Khan Sheikhoun. Source: OPCW. Isn’t it late in the game to try and pinpoint the perpetrator s? After all, it’s not in anyone’s best interest to be blamed. Dear allies, armament experts in the Russian Federation! If press reports are true, Saudi Arabia may be making a U turn on Syria. This development comes after Syria was severely damaged by the war and half of its population has been displaced in one way or the other. Watch the war against Isis on the Syrian-Lebanese borders and in Dayr Azzour. Nusra is next but Isis seems to be an easier target now, politically. Efforts to draw a wedge between the Syrian and Lebanese army did not succeed in the past and will not succeed today, the Lebanese army has a different function and system compared to Lebanese politicians and the presence of pro Aoun and pro hizbullah officers in the army makes it extremely difficult to use the army as a political stick to benefit war lords like Jajaa and Junblaat. Joint excercises and army-to-army relationships have been going on since the 1990s and were strengthened after 2006. This explains the attack on the Lebanese army by politicians, activists and media sympathetic to the Muslim brotherhood and Nusra in both Syria and Lebanon. Are you ashamed to be a citizen of a country so completely complicit in the commission of war crimes, like the bombing of hospitals, from Yemen to Syria? Any questions about what the US military is doing in Syria? The OPCW report stated ‘a sarin like substance’, a world of difference with what is stated here. Secondly this OPCW report is a scandal from the point of what an investigation really should look like. Also missing from this article is the name of al Qaeda that controles the area and all the communications coming from this place. A serieus fault. And if this hole in the road is from an airplane bomb then I’m father Christmas. Russian Foreign Ministry spokeswoman Maria Zakharova said on Thursday there is evidence that the West is supplying chemical weapons to militants in Syria. Sarin huh? First responders treating the wounded in barefeet, bare hands and no masks- yet not a single one impacted. This is not science- its paid for agit prop. There was a time when reading opposition media made sense sometimes but now there is nothing there but lies and beautification of the pig of terrorism, what a pathetic fate !! Has America robbed you of your tongue and your mind? Again and again US Administration Is using the terror group ISIS as a pawn in its depraved foreign policy. I have to wonder against whom these weapons are to be used? seems that CIA and their Mossad bosses have certainly been very busy. The Syrian national team is about to write history in gold. If Syria wins next game against Iran then Russia, Iran and Syria will be part of the Russia World Cup next year. That’s how you do with your allies! To all paid trolls on this site, I hope you made good $$ during the last 7 years. Your job is done and now you gotta take some bench time till further actions break out in another country. Hopefully one of the Arab Gulf country next on the chopping bloc. I would not say it was nice chatting with you but for sure you were quite entertaining. Game Over Losers, Syria won! So the UN have concluded that the Syrians are responsible for the attacks with the complicity of Russia. Alan, what’s wrong with burnt pork? Never had Pork Cracklings? Have some of them and cut back on the camel urine and vodka cocktails and you may be able to see reality instead of the propaganda you are regurgitating.